Richard’s and my puppy is now 12 weeks old — growing fast in his legs, his collar size and his physical competence. Last night he found out he could leap successfully onto furniture. We hope he’ll forget that discovery for a little longer. Though he’s still got months of puppyhood ahead of him, he’s already fast and wily enough to cause as much of a stir as a human kid who’s much older. 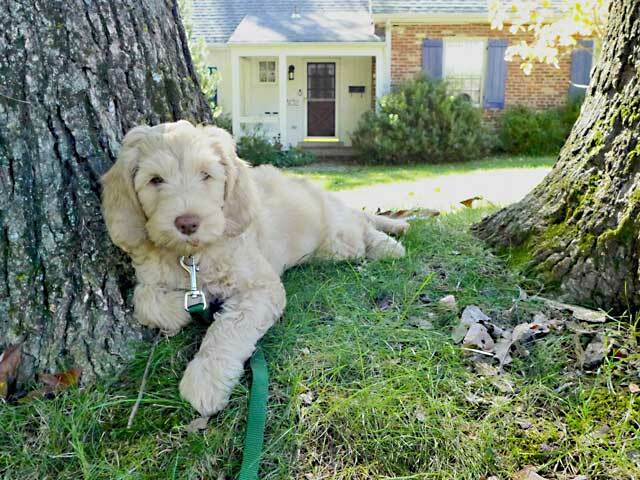 He has a great playdate with Jake, Arlene & John’s Golden Doodle from Arlington. Barney meets yoga instructors Rebecca and Wendy. He works the sidewalks like a Clinton. On his first visit to the vet, Barney weighs 9 pounds. As an offspring of medium-size doodles, he’s expected to top out around 40 pounds. Barney leaves his mother, siblings and breeder in southeastern Pennsylvania and goes home with Richard & Steve Oct. 4, 2013. He will have his first play dates Oct. 6 with Lily, a timid lady hound, and Sherman, an ambivalent Cocker Spaniel. As things usually go, Barney comes home as a dog of small stature. Click pictures above or below to enlarge. 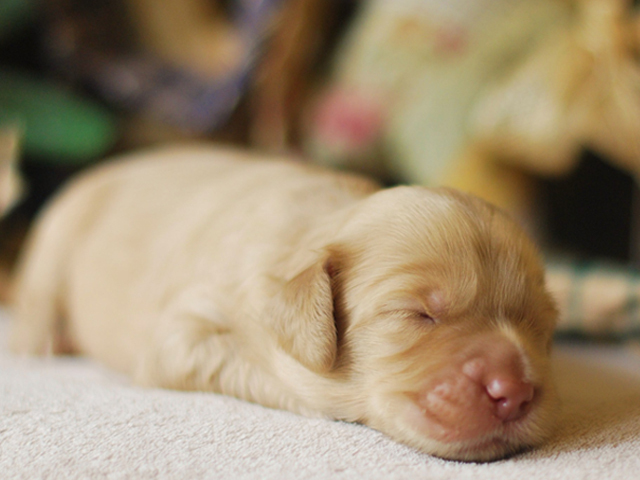 Puppy photos below by breeder Diane Rocker. 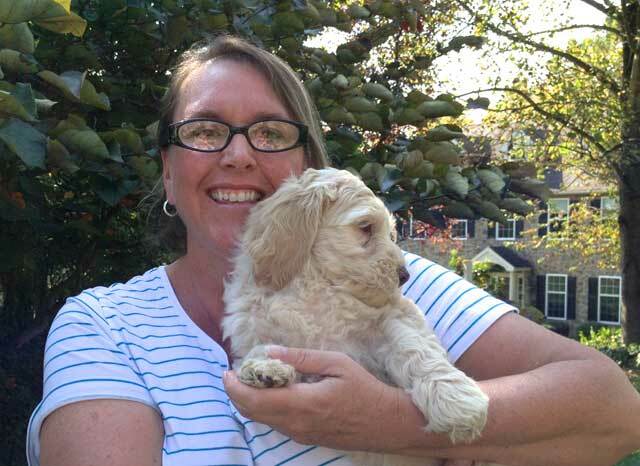 One of the final tasks for breeder Diane Rocker, proprietor of Delaware Valley Labradoodles (below, with Barney), is to match the owner-applicants with appropriate puppies. She takes into account her clients’ puppy preferences. Barney begins to look like himself, which is like a wavy-haired Muppet with Andy Rooney’s eyebrows. While eagerly inspecting monthly updates from the breeder, we settle on Barney as the puppy’s name. His namesakes: Barney Frank, Barney Fife, Barney Rubble, Barney the dinosaur and Barnaby, Steve’s second childhood budgerigar. As the litter finishes its fifth week of life, prospective adopters meet the five puppies in the recreation room of the breeder’s house. Richard locks eyes (below) with one of the three caramel-colored pups in the litter, later named Barney. Mother Mimi with newborn litter of five delivered at Delaware Valley Labradoodles in Kemblesville, Pa. A few month earlier Mimi “honeymooned” with the daddy, Schoggi (in frame). 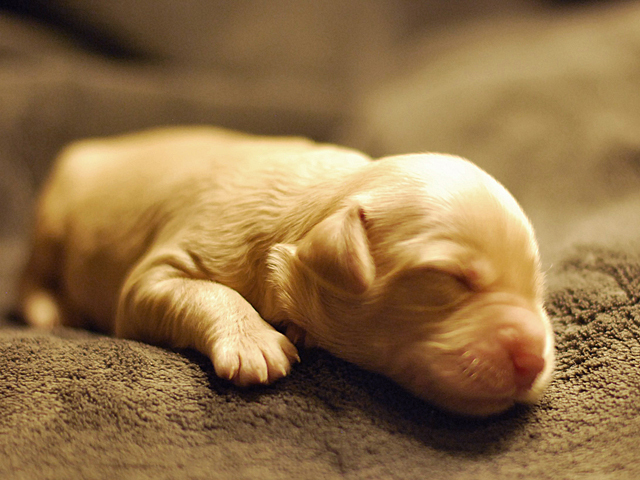 Both parents are Australian Labradoodles, an unofficial but well-documented multigenerational breed based largely on Labrador retrievers and poodles. They’re fostered to produce companionable service dogs and pets that can be tolerated by many people with pet allergies. More information at the Australian Labradoodle Association of America.